Lehi’s son Jacob had a slightly different focus. Jacob was consecrated a priest by his brother Nephi (see 2 Nephi 5:26). Jacob's concern about priestly matters such as holiness may be seen in the fact that Jacob used the divine title "Holy One of Israel" more than any other Book of Mormon writer. Furthermore, Welch noticed, “Jacob’s priestly functions are reflected in the testimony that he bears of Christ.”8 For example, Jacob used the title of "Christ" in 2 Nephi 10:3, where he explained, “for in the last night the angel spake unto me that this should be his name” (2 Nephi 10:3). Jacob’s priestly functions may explain why an angel would go on to reveal the name or title “anointed one” to him. The temple, where Jacob’s address was delivered, was the place where the Lord chose to put his name (see Deuteronomy 12:11; 16:6). The priestly vestments, according to Exodus, included “a plate of pure gold,” engraven with the words “HOLINESS TO THE LORD” and fastened to the High Priest’s forehead (see Exodus 28:36–38). Compatibly, the atonement is a major theme in Jacob’s address, which Elder Jeffrey R. Holland has called “one of the most definitive sermons on the Atonement recorded in any scripture.”13 Furthermore, the atonement rituals were part of the performances done during the autumn festivals, the likely occasion of Jacob’s address.14 Being the first high priest among the Nephites, and likely performing many of the necessary rites for the first time, the exact particulars—such as which name or title to use for God—would have been on Jacob’s mind. Other similar reflections can be drawn out of the individualized usages of the names for Christ by each of the writers in the Book of Mormon. Knowing the name of God is a high spiritual honor and privilege. Moses asked and was told the name by which the Lord could be known. King Benjamin gave to his people the Savior's name, the knowledge of which distinguished them above all people. Keeping the name of God holy is one of the Ten Commandments. Knowing God's names and functions allows righteous individuals to call upon him for mercy, guidance, and deliverance. Jesus Christ has many titles, representing his many roles in our lives and the great eternal plan. Everyone relates to the Savior and the atonement in their own, unique, individual ways. Often how we relate to Christ is shaped by our personal experiences and circumstances, changing over time as we learn, grow, and mature. It, therefore, should come as no surprise that this is true about each of the prophets in the Book of Mormon. Studying the different names for Christ that specific prophets used teaches us many things. It connects us to those prophets as real people who lived real lives—these are not wooden and stock characters. It reveals the varied personalities in the book and provides additional evidence for multiple authorship of that record. It illustrates the logic and consistency in the use of the 101 different names and titles used for Christ. 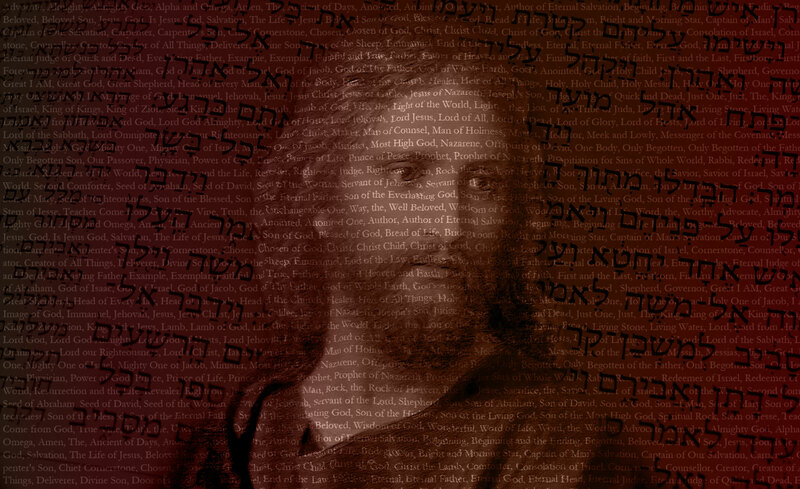 When the circumstances of the individual prophets are considered and it appears that the names and titles chosen naturally fit the context of their testimonies and teachings of Jesus Christ, it is hard to imagine that these prophetic expressions are fabrications. Even seen as fiction, this subtle consistency is a clear indication of compositional sophistication beyond Joseph Smith’s writing ability. While seen as the genuine writings of real individual prophets, this intimate familiarity with particular attributes of Christ rings true as those individuals testify within the pages of this testament of Jesus Christ. Taylor Halverson, "Finding the first use of the name Christ in the Book of Mormon," Deseret News, February 8, 2016. Dallin H. Oaks, His Holy Name (Salt Lake City, UT: Deseret Book, 2009). John W. Welch and J. Gregory Welch, Charting the Book of Mormon: Visual Aids for Personal Study and Teaching (Provo, Utah: FARMS, 1999), charts 44–47. John W. Welch, “Ten Testimonies of Jesus Christ in the Book of Mormon” (FARMS Preliminary Reports, 1994); developed further in “Ten Testimonies of Jesus Christ from the Book of Mormon,” in Doctrines of the Book of Mormon, ed. Bruce A. Van Orden and Brent L. Top (Salt Lake City, UT: Deseret Book, 1992), 223-242; reprinted in A Book of Mormon Treasury (Salt Lake City and Provo, UT: Deseret Book and BYU Religious Studies Center, 2003), 316–342. Edward J. Brandt, "The Name Jesus Christ Revealed to the Nephites," in Second Nephi, The Doctrinal Structure, ed. Monte S. Nyman and Charles D. Tate Jr. (Provo, UT: Religious Studies Center, Brigham Young University, 1989), 201–206. Susan Easton Black, Finding Christ Through the Book of Mormon (Salt Lake City, UT: Deseret Book, 1987). 1. Susan Easton Black, Finding Christ Through the Book of Mormon (Salt Lake City, UT: Deseret Book, 1987), 16–18. 2. John W. Welch and J. Gregory Welch, Charting the Book of Mormon: Visual Aids for Personal Study and Teaching (Provo, UT: FARMS, 1999), 44. There is no pagination, numbers refer to the chart number. 3. John W. Welch, “Ten Testimonies of Jesus Christ in the Book of Mormon” (FARMS Preliminary Reports, 1994), 3. Developed further in John W. Welch, “Ten Testimonies of Jesus Christ from the Book of Mormon,” in Doctrines of the Book of Mormon, ed. Bruce A. Van Orden and Brent L. Top (Salt Lake City, UT: Deseret Book, 1992), 223–242; reprinted in A Book of Mormon Treasury (Salt Lake City and Provo, UT: Deseret Book and BYU Religious Studies Center, 2003), 316–342. 4. Welch and Welch, Charting the Book of Mormon, 46. 5. Welch, “Ten Testimonies of Jesus Christ,” 4. 6. Welch, “Ten Testimonies of Jesus Christ,” 4. 7. Welch, “Ten Testimonies of Jesus Christ,” 4. 8. Welch, “Ten Testimonies of Jesus Christ,” 7. 9. See discussion in Margaret Barker, The Great Angel: A Study of Israel’s Second God (Louisville, KY: Westminster/John Knox Press, 1992), 98. 10. See discussion in Margaret Barker, King of the Jews: Temple Theology in John’s Gospel (London: Society for Promoting Christian Knowledge, 2014), 101–102. 11. Welch, “Ten Testimonies of Jesus Christ,” 7. 12. Barker, The Great Angel, 98. 13. Jeffrey R. Holland, Christ and the New Covenant: The Messianic Message of the Book of Mormon (Salt Lake City, UT: Deseret Book, 1998), 67. 14. Book of Mormon Central, “How is Jacob’s Speech Related to Ancient Israelite Autumn Festivals? (2 Nephi 6:4)” KnoWhy 32 (February 12, 2016); John S. Thompson, “Isaiah 50–51, the Israelite Autumn Festivals, and the Covenant Speech of Jacob in 2 Nephi 6–10,” in Isaiah in the Book of Mormon, ed. Donald W. Parry and John W. Welch (Provo, UT: FARMS, 1998), 139–142.